New at PatioProductions.com! A high end line of synthetic outdoor wicker furniture that's as durable as it is beautiful. Discover elegant wicker patio dining sets, relaxing outdoor wicker daybeds, sofa sets and more all made to withstand life outdoors year round. Wicker furniture is a beautiful addition to any backyard or patio area because it blends in with the natural outdoor décor. Our outdoor wicker sofa sets are available in traditional, tropical, and contemporary styles that everyone will love. With wicker furniture there is something for everyone. We can guarantee that you’ll find something that you love in our selection of wicker patio furniture. Ranging from geometric designs to tropical outdoor bars perfect for poolside to traditional rattan sofa sets, synthetic patio wicker is the newest and most exciting trend to hit outdoor wicker furniture in years! The frames we use are 100% prime aluminum. We like to avoid steel because of its tendency to rust. With aluminum, the rust is the same color as the regular aluminum, so your outdoor patio sets will look new for years to come. 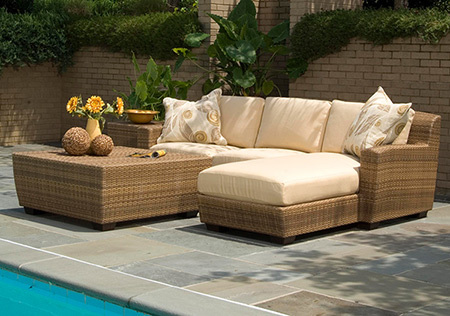 Our sets combine the best in luxury all-weather wicker at an exceptional value. The comfort and style of wicker is unbeatable. Not only that, but the maintenance on these sets is almost non existent. Buy your pieces as a set and save! This is anything but your standard patio furniture or the outdoor wicker furniture you remember from sunrooms of your childhood. Every piece, from the rustproof and powder coated aluminum frames to the polyethylene wicker itself, and including the cushions themselves, are made of the latest all-weather materials designed to resist the wear and tear of mother nature. And the best part...it’s completely maintenance free! No worrying about fading, warping, chipping, or any of the problems of natural rattan wicker furniture. Competitors will use cheap synthetic materials and thin steels for the frames. It’s important to us that our outdoor wicker patio sets are only the highest quality. Not only are they strong and durable, they’re also good for the environment. If you’re concerned about dirt or grime building up on your wicker furniture, a quick rinse with water and mild soap will do the trick! One of the best parts about wicker furniture is the ability to leave it outside all year long. Our outdoor safe, synthetic weave is designed to withstand exposure to sun and weather and still stay looking and feeling beautiful for years to come. With great new styles to choose from, we invite you to put as much passion into your outdoor furniture as you do for your indoor furniture. After all, everyone wants to spend more time relaxing outdoors. So why not make the most of the warm summer months and treat yourself and your guests to an all weather outdoor wicker furniture set that truly defines your style! Let us be your source for quality synthetic wicker outdoor furniture that looks better than the real thing!